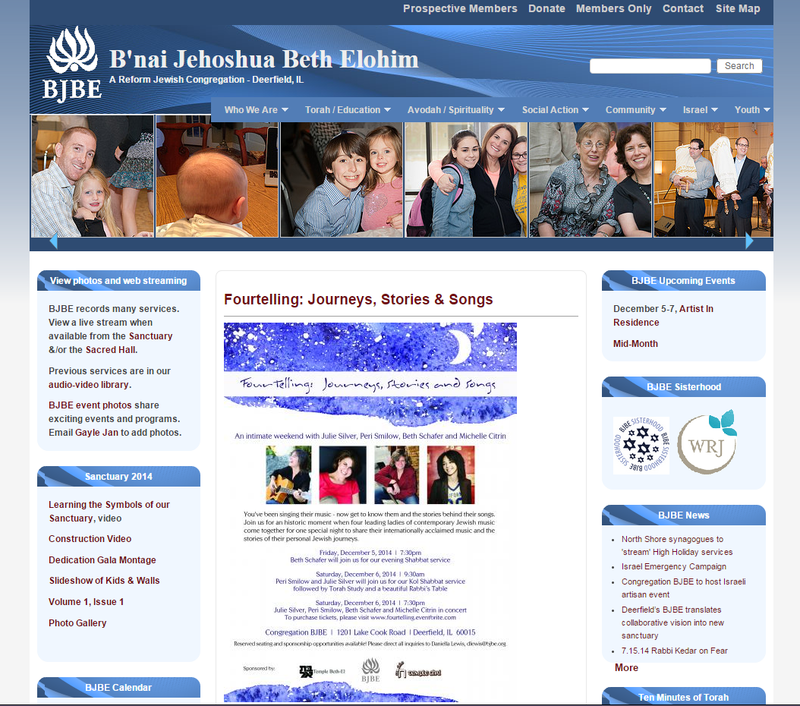 Located in Chicago, Congregation B'nai Jehoshua Beth Elohim serves a community of over 1,000 members. Their static website didn't reflect their new suburban home or the closeness of their community. Staff were often distracted answering questions about events, registering members, and searching for information. Our job was to reduce staff burden while increasing organizational awareness and serving the community. A visit to their offices identified many tasks that were overwhelming the staff. We simply needed to shift the burden to an easy to maintain website. This was a case of "you never know until you ask." Our request for interviews with all staff was greeted with some skepticism. But once we gathered those insights they were met with amazement. Management learned as much as our interviewers as to how the website could morph into a tool to serve both the community and the staff. Following discovery we did a content strategy deep dive. With little to work from on the existing website, we identified gaps in content and messaging. We then developed a structure that would allow the posting of content in pages driven by taxonomies, and provided for the display of related content. This plan significantly improved the ability for members to locate information. We integrated the site with Ustream for live streaming of services directly from the congregation, with FLICKR for photo sharing, with the MMOnTheWeb congregation management system and with a variety of interactive news feeds. The home page image ticker is generated directly from a FLICKR gallery. We also implemented multi-blog capability and left BJBE with a variety of tools that allow them to create the pages needed to communicate with their congregation without significant technical support. The site was recently upgraded to Drupal 7. During the summer of 2016, we will be redesigning the page layouts and providing a mobile-friendly platform.